But there’s growing evidence that these two impulses, toward energy and food independence, may be at odds with each other. Tonight’s guests have heard about residential drinking wells tainted by fracking fluids in Pennsylvania, Wyoming and Colorado. They’ve read about lingering rashes, nosebleeds and respiratory trauma in oil-patch communities, which are mostly rural, undeveloped, and lacking in political influence and economic prospects. The trout nibblers in the winery sympathize with the suffering of those communities. But their main concern tonight is a more insidious matter: the potential for drilling and fracking operations to contaminate our food. The early evidence from heavily fracked regions, especially from ranchers, is not reassuring. This article was orignally published in The Nation and was produced in collaboration with the Food & Environment Reporting Network, an investigative reporting nonprofit focusing on food, agriculture and environmental health. In a Brooklyn winery on a sultry July evening, an elegant crowd sips rosé and nibbles trout plucked from the gin-clear streams of upstate New York. The diners are here, with their checkbooks, to support a group called Chefs for the Marcellus, which works to protect the foodshed upon which hundreds of regional farm-to-fork restaurants depend. The foodshed is coincident with the Marcellus Shale, a geologic formation that arcs northeast from West Virginia through Pennsylvania and into New York State. As everyone invited here knows, the region is both agriculturally and energy rich, with vast quantities of natural gas sequestered deep below its fertile fields and forests. In Pennsylvania, the oil and gas industry is already on a tear—drilling thousands of feet into ancient seabeds, then repeatedly fracturing (or “fracking”) these wells with millions of gallons of highly pressurized, chemically laced water, which shatters the surrounding shale and releases fossil fuels. New York, meanwhile, is on its own natural-resource tear, with hundreds of newly opened breweries, wineries, organic dairies and pastured livestock operations—all of them capitalizing on the metropolitan area’s hunger to localize its diet. Drilling rig visible from the Schilke ranch in North Dakota. Jacki Schilke and her sixty cattle live in the top left corner of North Dakota, a windswept, golden-hued landscape in the heart of the Bakken Shale. 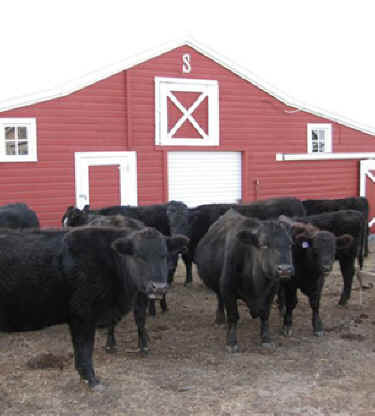 Schilke’s neighbors love her black Angus beef, but she’s no longer sharing or eating it—not since fracking began on thirty-two oil and gas wells within three miles of her 160-acre ranch and five of her cows dropped dead. Schilke herself is in poor health. A handsome 53-year-old with a faded blond ponytail and direct blue eyes, she often feels lightheaded when she ventures outside. She limps and has chronic pain in her lungs, as well as rashes that have lingered for a year. Once, a visit to the barn ended with respiratory distress and a trip to the emergency room. Schilke also has back pain linked with overworked kidneys, and on some mornings she urinates a stream of blood. Ambient air testing by a certified environmental consultant detected elevated levels of benzene, methane, chloroform, butane, propane, toluene and xylene—compounds associated with drilling and fracking, and also with cancers, birth defects and organ damage. Her well tested high for sulfates, chromium, chloride and strontium; her blood tested positive for acetone, plus the heavy metals arsenic (linked with skin lesions, cancers and cardiovascular disease) and germanium (linked with muscle weakness and skin rashes). Both she and her husband, who works in oilfield services, have recently lost crowns and fillings from their teeth; tooth loss is associated with radiation poisoning and high selenium levels, also found in the Schilkes’ water. Schilke’s story reminds us that farmers need clean water, clean air and clean soil to produce healthful food. But as the largest private landholders in shale areas across the nation, farmers are disproportionately being approached by energy companies eager to extract oil and gas from beneath their properties. Already, some are regretting it. Earlier this year, Michelle Bamberger, an Ithaca veterinarian, and Robert Oswald, a professor of molecular medicine at Cornell’s College of Veterinary Medicine, published the first (and, so far, only) peer-reviewed report to suggest a link between fracking and illness in food animals. The authors compiled case studies of twenty-four farmers in six shale-gas states whose livestock experienced neurological, reproductive and acute gastrointestinal problems. Exposed either accidentally or incidentally to fracking chemicals in the water or air, scores of animals have died. The death toll is insignificant when measured against the nation’s livestock population (some 97 million beef cattle go to market each year), but environmental advocates believe these animals constitute an early warning. In Louisiana, seventeen cows died after an hour’s exposure to spilled fracking fluid. (Most likely cause of death: respiratory failure.) In north central Pennsylvania, 140 cattle were exposed to fracking wastewater when an impoundment was breached. Approximately seventy cows died; the remainder produced eleven calves, of which only three survived. In western Pennsylvania, an overflowing waste pit sent fracking chemicals into a pond and a pasture where pregnant cows grazed: half their calves were born dead. The following year’s animal births were sexually skewed, with ten females and two males, instead of the usual 50-50 or 60-40 split. In addition to the cases documented by Bamberger, hair testing of sick cattle that grazed around well pads in New Mexico found petroleum residues in fifty-four of fifty-six animals. In North Dakota, wind-borne fly ash, which is used to solidify the waste from drilling holes and contains heavy metals, settled over a farm: one cow, which either inhaled or ingested the caustic dust, died, and a stock pond was contaminated with arsenic at double the accepted level for drinking water. Fracking a single well requires up to 7 million gallons of water, plus an additional 400,000 gallons of additives, including lubricants, biocides, scale and rust inhibitors, solvents, foaming and defoaming agents, emulsifiers and de-emulsifiers, stabilizers and breakers. About 70 percent of the liquid that goes down a borehole eventually comes up—now further tainted with such deep-earth compounds as sodium, chloride, bromide, arsenic, barium, uranium, radium and radon. (These substances occur naturally, but many of them can cause illness if ingested or inhaled over time.) This super-salty “produced” water, or brine, can be stored on-site for reuse. Depending on state regulations, it can also be held in plastic-lined pits until it evaporates, is injected back into the earth, or gets hauled to municipal wastewater treatment plants, which aren’t designed to neutralize or sequester fracking chemicals (in other words, they’re discharged with effluent into nearby streams). Underground, petrochemicals can migrate along fissures through abandoned or orphaned wells or leaky well casings (the oil and gas industry estimates that 60 percent of wells will leak over a thirty-year period). Brine can spill from holding ponds or pipelines. It can be spread, legally in some places, on roadways to control dust and melt ice. Truck drivers have also been known to illegally dump this liquid in creeks or fields, where animals can drink it or lick it from their fur. Although energy companies don’t make a habit of telling potential lease signers about the environmental risks they might face, the Securities and Exchange Commission requires them to inform potential investors. In a 2008 filing, Cabot Industries cited “well site blowouts, cratering and explosions; equipment failures; uncontrolled flows of natural gas, oil or well fluids; fires; formations with abnormal pressures; pollution and other environmental risks.” In 2011, oil companies in North Dakota reported more than 1,000 accidental releases of oil, drilling wastewater or other fluids, with many more releases likely unreported. Between 2008 and 2011, drilling companies in Pennsylvania reported 2,392 violations of law that posed a direct threat to the environment and safety of communities. 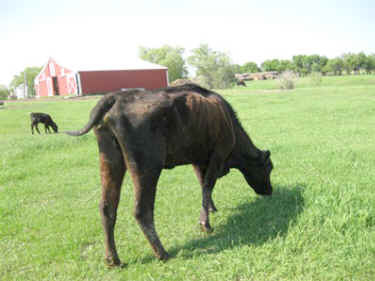 Schilke ranch cow that has lost its tail, one of many ailments found in cattle following hydrofracturing of the Bakken Shale in North Dakota. An inveterate label reader who obsessively tracks her animals’ nutritional intake, Schilke couldn’t figure out what was wrong. Neither could local veterinarians. She nursed individual cows for weeks and, with much sorrow, put a $5,000 bull out of its misery with a bullet. Upon examination, the animal’s liver was found to be full of tunnels and its lungs congested with pneumonia. Before the year was out, five cows had died, in addition to several cats and two dogs. (A feline autopsy came back inconclusive, but subsequent hair testing of cows, cats and dogs revealed sulfate levels high enough to cause polio in cattle.) Inside Schilke’s house today, where the china cabinets are kept empty for fear of a shattering drill-site explosion, nearly a dozen cats sneeze and cough, some with their heads tilted at a creepy angle. No one doubts that fracking fluids have the potential to do serious harm. Theo Colborn, an environmental health analyst and former director of the World Wildlife Fund’s wildlife and contaminants program, identified 632 chemicals used in natural-gas production. More than 75 percent of them, she said, could affect sensory organs and the respiratory and gastrointestinal systems; 40 to 50 percent have potential impacts on the kidneys and on the nervous, immune and cardiovascular systems; 37 percent act on the hormone system; and 25 percent are linked with cancer or mutations. Thanks to public pressure, several states have started to tighten regulations on the cement casings used to line wells, and the Obama administration recently required energy companies to disclose, on the industry-sponsored website fracfocus.org, the fracking chemicals used on public land. (States regulate fracking on private land and set different requirements.) Still, information about quantities and concentrations of the chemicals remains secret, as do compounds considered proprietary. Further, no state requires a company to disclose its ingredients until a fracking job is complete. At that point, it’s easy to blame the presence of toxins in groundwater on a landowner’s use of pesticides, fertilizers or even farm equipment. Clearly, the technology to extract gas from shale has advanced faster, and with a lot more public funding, than has the study of its various effects. To date, there have been no systematic, peer-reviewed, long-term studies of the health effects of hydraulic fracturing for oil and gas production (one short-term, peer-reviewed study found that fracking emissions may contribute to acute and chronic health problems for people living near drill sites). And the risks to food safety may be even more difficult to parse. Veterinarians don’t know how long the chemicals may remain in animals, and the Food Safety Inspection Service, part of the US Department of Agriculture, isn’t looking for them in carcasses. Inspectors in slaughterhouses examine organs only if they look diseased. “It’s gross appearance, not microscopic,” Bamberger says of the inspections—which means that animals either tainted or sickened by those chemicals could enter the food chain undetected. “The USDA focuses mostly on pathogens and pesticide residues,” says Tony Corbo, a senior lobbyist for Food and Water Watch. “We need to do risk assessments for these fracking chemicals and study tolerance levels.” The process, he adds, could take more than five years. In the meantime, fractivists are passing around a food-pyramid chart that depicts chemicals moving from plants into animals, from animals into people, and from people into… zombies. The relatively small number of animals reported sick or dead invites the question: If oil and gas operations are so risky, why aren’t there more cases? There likely are, but few scientists are looking for them. (“Who’s got the money to study this?” Colborn asks rhetorically.) Rural vets won’t speak up for fear of retaliation. And farmers aren’t talking for myriad reasons: some receive royalty checks from the energy companies (either by choice or because the previous landowner leased their farm’s mineral rights); some have signed nondisclosure agreements after receiving a financial settlement; and some are in active litigation. Some farmers fear retribution from community members with leases; others don’t want to fall afoul of “food disparagement” laws or get sued by an oil company for defamation (as happened with one Texan after video of his flame-spouting garden hose was posted on the Internet. The oil company won; the homeowner is appealing). And many would simply rather not know what’s going on. “It takes a long time to build up a herd’s reputation,” says rancher Dennis Bauste, of Trenton Lake, North Dakota. “I’m gonna sell my calves, and I don’t want them to be labeled as tainted. Besides, I wouldn’t know what to test for. Until there’s a big wipeout, a major problem, we’re not gonna hear much about this.” Ceylon Feiring, an area vet, concurs. “We’re just waiting for a wreck to happen with someone’s cattle,” she says. “Otherwise, it’s just one-offs”—a sick cow here and a dead goat there, easy for regulators, vets and even farmers to shrug off. However, some institutions that specialize in risk have started to connect the dots. Nationwide Mutual Insurance, which sells agricultural insurance, recently announced that it would not cover damages related to fracking. Rabobank, the world’s largest agricultural bank, reportedly no longer sells mortgages to farmers with gas leases. And in the boldest move yet by a government official, Christopher Portier, director of the National Center for Environmental Health at the Centers for Disease Control and Prevention, called for studies that “include all the ways people can be exposed, such as through air, water, soil, plants and animals.” While the EPA is in the midst of a $1.9 million study of fracking’s impact on water, no government agency has taken up Portier’s challenge to study plants and animals. The possibility of chemical contamination aside, oil and gas operations have already affected food producers. “I lost six acres of hayfields when the gas company put roads in,” says Terry Greenwood, a rancher in western Pennsylvania. “Now I have to buy more feed for my cattle.” (Like other farmers hurt by drilling and fracking, he still pays taxes on his unproductive land.) Others have lost the use of stock ponds or creeks to brine spills. “We’ve got 12,000 wells in the Bakken, and they each take up six acres,” says Mark Trechock, former director of the Dakota Resource Council. “That’s 72,000 acres right there, without counting the waste facilities, access roads, stored equipment and man camps that go along with the wells.” Before the drilling boom, that land might have produced durum wheat, barley, oats, canola, flax, sunflowers, pinto beans, lentils and peas. In Pennsylvania, where nearly 6,500 wells have been drilled since 2000, the Nature Conservancy estimates that thirty acres are directly or indirectly affected for every well pad. East of the Rockies, intensive drilling and fracking have pushed levels of smog, or ground-level ozone, higher than those of Los Angeles. Ozone significantly diminishes crop yields and reduces the nutritional value of forage. Flaring of raw gas can acidify soil and send fine particulate matter into the air; long-term exposure to this material has been linked to human heart and lung diseases and disruption to the endocrine system. Earlier this year, the Environmental Protection Agency finalized standards that require reductions in airborne emissions from gas wells, although the industry has more than two years to comply. Nor do the 16,200 members of the Park Slope Food Co-op in Brooklyn, which buys one cow per week from Jaffe. “If hydrofracking is allowed in New York State, the co-op will have to stop buying from farms anywhere near the drilling because of fears of contamination,” says Joe Holtz, general manager of the co-op. That’s $4 million in direct sales, with economic multipliers up and down the local food chain, affecting seed houses, creameries, equipment manufacturers and so on. Already, wary farmers in the Marcellus are seeking land away from the shale. The outward migration is simultaneously raising prices for good farmland in the Hudson River Valley, which lies outside the shale zone, and depressing the price of land over the Marcellus. According to John Bingham, an organic farmer in upstate New York who is involved in regional planning, lower prices entice absentee investors to buy up farmland and gain favorable “farm rate” tax breaks, even as they speculate on the gas boom. “Fracking is not a healthy development for food security in regions near fracking or away from it,” Bingham concludes. Only recently has the Northeast’s local-foods movement reached a critical mass, to the point where colleges and caterers trip over themselves in the quest for locally sourced and sustainably grown products. (New York has the fourth-highest number of organic farms in the nation.) But the movement’s lofty ideals could turn out to be, in shale-gas areas, a double-edged sword. “People at the farmers’ market are starting to ask exactly where this food comes from,” says Stephen Cleghorn, a Pennsylvania goat farmer. With a watchful eye on Pennsylvania’s turmoil, many New York farmers have started to test their water pre-emptively, in the event that Governor Andrew Cuomo lifts the state’s current moratorium on fracking. And in the commercial kitchens of a city obsessed with the provenance of its prosciutto, chefs like Heather Carlucci-Rodriguez, a founder of Chefs for the Marcellus and the executive pastry chef at Manhattan’s Print Restaurant, are keeping careful tabs on their regional suppliers.